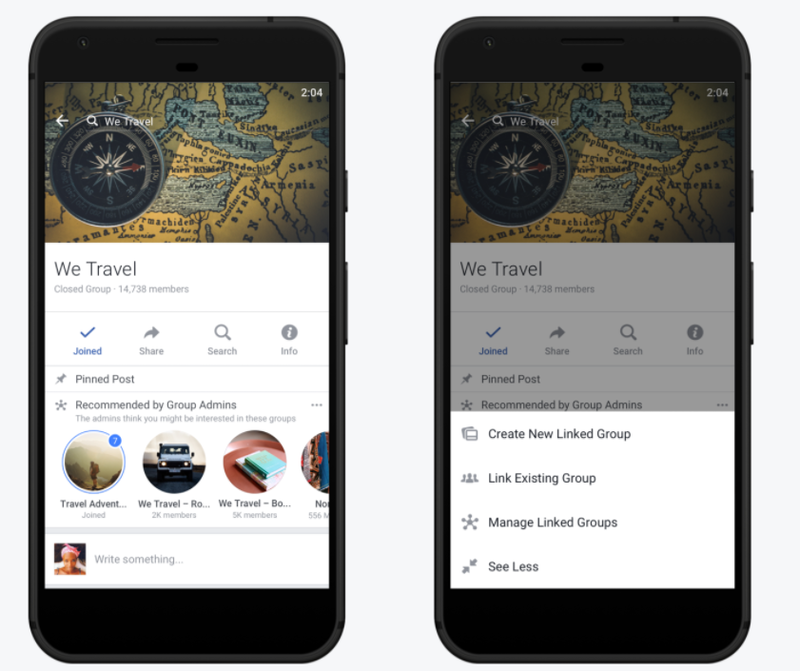 Back in January, we noted that Facebook seemed to be putting increased focus on Groups, with a range of new tools and features in test mode, as reported by various users. As it turns out, Facebook has been developing a set of new Groups features - with Groups now being used by more than a billion people per month, Facebook's launched a range of new tools to improve Group functionality, while also announcing a change in Facebook's mission statement which underlines the importance of such communities. The first big addition is Group Insights, a way for Group admins to get an overview of how their group if growing, when people are most engaged and how active individual members are within the conversation. This is the big ticket item of the update - Facebook says Group admins have been calling for better ways to assess their Group strategy in order to improve engagement. The new Insights tools definitely provide that, while they'll also make Groups a significantly more relevant consideration for businesses - particularly considering Facebook also recently announced changes which enable Pages to link directly to Groups and post in Groups as Pages. The new tools will allow for direct reporting and KPIs aligned with Group actions, while also helping brands get a better understanding of the key concerns and focus points of their target market. In addition to becoming a more appealing business prospect on their own, the introduction of such tools could also inspire brands to seek out partnerships with admins of prominent Groups related to their sector, in order to gather relevant information. For example, brands would love to have access to data on the most resonant topics in high-activity groups, helping to guide strategic direction, or the most influential members, for possible influencer outreach. While the tools are not specifically designed for marketing purposes, the introduction of more focused insights will facilitate more use cases for brands. Worth considering in your process. 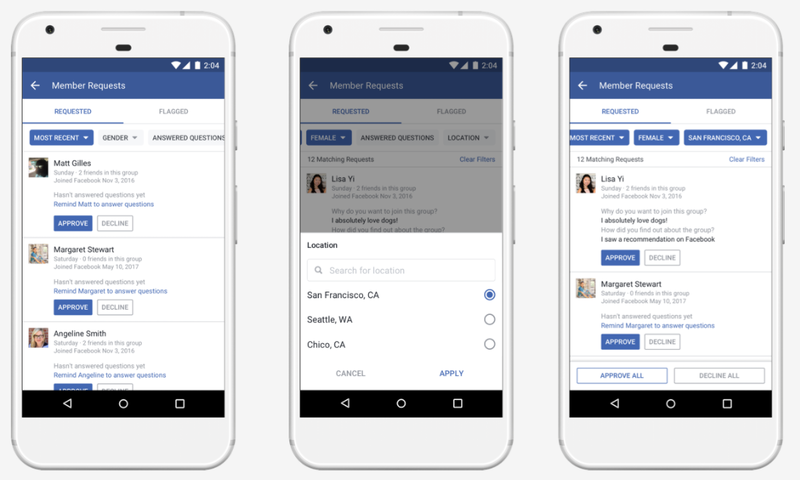 Facebook's also adding new tools to help filter membership requests in order to expedite the application management process. "We also hear from admins that admitting new members is one of the most time-consuming things they do. So, we added a way for them to sort and filter membership requests on common categories like gender and location, and then accept or decline all at once." The logic behind the addition is clear, but as noted by TechCrunch, filtering member requests in this manner could lead to some people being rejected on the wrong grounds, particularly in the case of gender identification. Note too, that one of the qualifiers listed in the above example is 'Answered Questions' relating to Facebook's recently added option to enable membership questionnaires to filter the Group membership process and keep out those seeking to join for the wrong reasons. 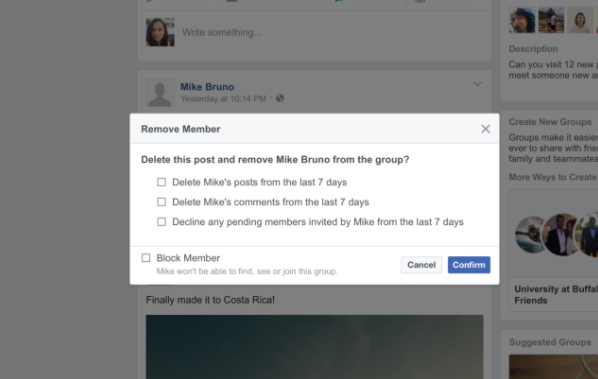 Facebook's also making it easier to remove users, and their content, from your Group in one easy step. This will be extremely helpful for those admins seeking to manage spammers - often, the Groups experience gets clogged with overly self-promotional junk that can be difficult for admins to stay on top of. Now, if there's someone who's not contributing to the intended discussion, you can cut them out straight away. Facebook's also giving Group admins the capacity to schedule Group posts. Like Insights, the option brings Groups more in parity with Pages - which makes sense, they're essentially an operation that requires planning and structure, the same as building your Page audience. Scheduling will better enable Group admins to work with their Insights data to maximize appeal by posting at optimal times, while it will also benefit business Groups by making it easier to plan out announcements and updates. And the last major update is the ability for Groups to link to other Groups, enabling admins to recommend related discussion. This update was actually spotted in testing last month, with a new indicator on some Pages highlighting linked Groups below the main image. It seems like a smaller addition, but there's a lot of potential to utilize this option to expand Group discussion, particularly for brands. For example, you might have a support group, and a group for fans - depending on the size of your business, it could by viable to split the discussions entirely, giving you a totally unique discussion chain for each element, which would also enable better tracking of the most relevant discussion points in each segment. The changes were announced at the opening of Facebook's first ever Groups Summit in Chicago, where Facebook invited "a few hundred group admins to gather, share and connect in real life." 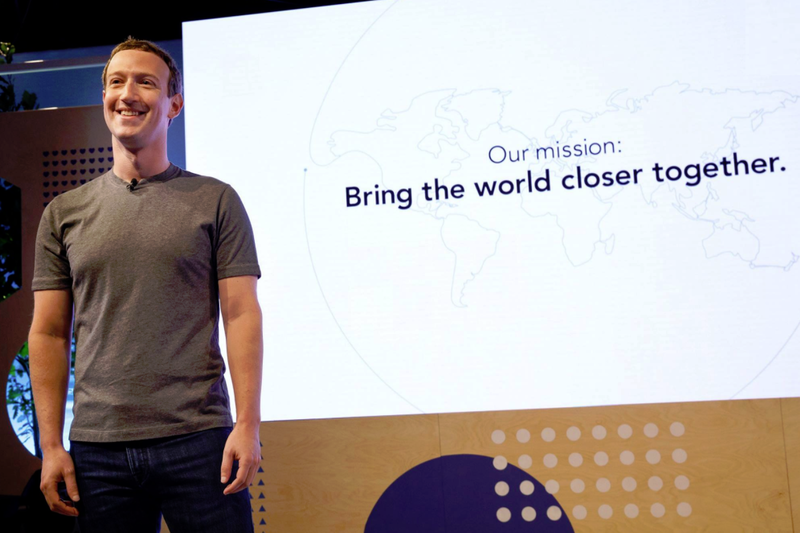 As noted, Facebook CEO Mark Zuckerberg also took the opportunity to share Facebook's updated mission statement - The Social Network has shifted from "Making the world more open and connected" to "Give people the power to build community and bring the world closer together", though "Bring the world closer together" will be the abridged version. "For the last decade or so we've been focusing on making the world more open and connected. But I used to think that if we just give people a voice and help some people connect that that would make the world a whole lot better by itself. Look around and our society is still so divided. We have a responsibility to do more, not just to connect the world but to bring the world closer together." The statement goes to the heart of the argument that Facebook facilitates echo chambers, where users only ever see opinions which align with their established stance, reinforcing division, as opposed to helping share more diverse perspective. Essentially, what Zuckerberg's saying is that giving people the tools to connect is not enough, you need to also help them understand why that's important, which is where Groups and community can play a part. How, exactly, Zuck and Co. plan to better showcase alternate opinion is unclear, but making it a core focus seems like a good first step. 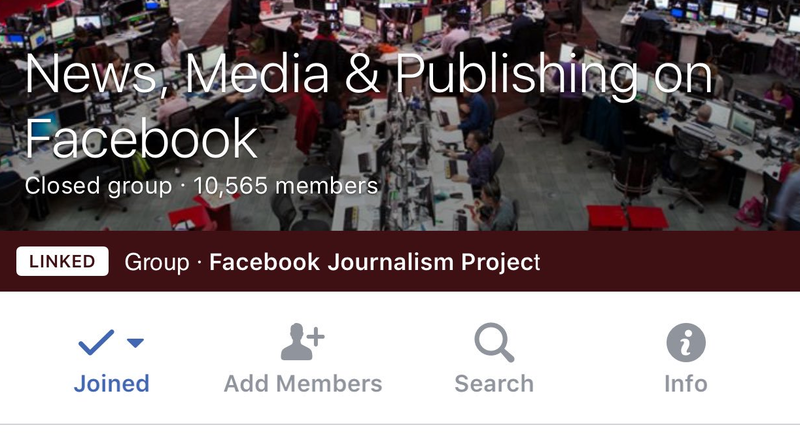 Facebook's new Group tools are being rolled out from today.